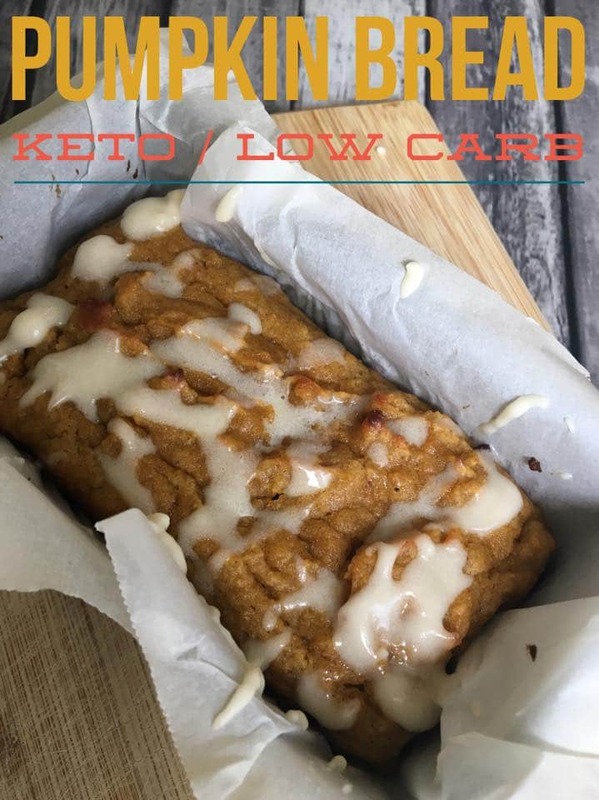 This Keto Pumpkin Bread recipe is going to be just what you need to stay on track during the tempting holiday season. I love pumpkin flavored desserts, but they are usually not at all low carb. This recipe was created to satisfy that craving and allow you to enjoy a delicious treat with no guilt! My oldest daughter asked me to make pumpkin bread yesterday. She loves my whole wheat pumpkin bread recipe but thought I might be able to create a keto/low carb friendly one. Although my kids are not 100% keto, I think she wanted me to bake something that I could enjoy as well. After a little trial and error, I think I have come up with a yummy keto pumpkin bread recipe! Note: let me set the expectation for you as I did get a little disheartened at the beginning of my keto journey when I saw recipes that said they “tasted like the real thing.” This does not taste like the kind of sugary pumpkin bread that we were all used to before we started following a keto/low carb way of life. There is not one low carb ingredient that I can substitute that tastes the same as a fluffy flour full of gluten. With that being said, this is a very very good alternative. It’s both moist and full of pumpkin flavor while being low carb, which is most important. This recipe makes 2 mini loaves. If you double it, you can make one regular sized loaf. This Keto Pumpkin Bread is moist, full of pumpkin spice flavor, and delicious. Beat eggs, swerve, pumpkin puree, sour cream, vanilla, and pumpkin pie spice until combined. Pour into 2 greased mini loaf pans or cover pan with parchment paper. To make a full regular loaf, you would need to double the recipe. Melt butter then add Swerve Confectioners. The sugar alcohols in Swerve are not included in the nutritional information since most subtract. Make our delicious Keto Pumpkin Bread as a treat that helps satisfy your cravings for all things pumpkin spice during the holiday season. You can make multiple batches of this and easily freeze them to pop out and use as a breakfast or dessert treat throughout the fall season. I recommend using freezer bags for storage to keep them tasty for up to 2-3 months. And if you love all things Pumpkin and Fall – you’ll definitely want to check out how to get FREE Mrs. Meyers Cleaning Products in Fall Scents from Grove! Choose from Pumpkin, Mum and Apple Cider scented home and cleaning products – for FREE. Get all the details here. « Amazon: Mrs. Meyers Deals! Can I bake it just one loaf in a regular loaf pan? Or it must be 2 mini loaves to cook correctly? You would need to double the recipe for it to work in a regular loaf pan. If you don’t have mini pans, you can also use muffin tins. I am confused as to why you would need to double it to fill a regular loaf pan if it makes two mini loaves. The mini loaf pans that are linked above are half the size of regular loaf pan which would lead me to believe that putting the entire recipe into a regular loaf pan would result in the right amount. Are you mini pans smaller than approx 4″ by 2″? Or is the depth the issue? I would think that depth would be the greater issue. I haven’t personally tried freezing it, but I would think it would freeze just fine. Definitely double the recipe for a full loaf. If not, you will have a thin rectangle. I just made a regular load and it’s perfect. Yes! Definitely double for a full loaf. If making muffins same oven temp?? I made a full loaf yesterday and used cream cheese instead. It’s absolutely delicious. Thanks for this recipe. If I was using powder erythrotol instead of swerve how much do I use? I’m not sure, I’ve only used Swerve. It’s the same. I use Swerve and erythritol interchangeably. The ratios are the same. Does it have to be powdered? Can it be regular? I’ve only made it as is but I would think it would work just fine. All I can find is Pure Pumpkin in a can, is it ok to use instead of pumpkin purée?? I would think so. I think it’s the same thing. Made the Pumpkin Bread – wow, what a treat. Although I am a sweet tooth, I would cut back on the Swerve a bit. I didn’t add the frosting. Feedback from my samplers was ‘its a bit too sweet’. But I will definitely make this again – looking forward to serving it up at Thanksgiving! Great! I’m so glad you enjoyed it. I love how a recipe can be tweaked to suit our individual tastes. Blessings to you! I made in muffin cups and they turned out great. I didn’t have time to do the icing and it’s really not necessary. The toothpick came out clean, but they were still overly moist. Should I cook longer or is this the normal texture? Without seeing yours, I am really not sure. They are very moist and the texture is different than regular flour. Is 3/4 cups of Swerve confectioners correct? That would be too many carbs to be Keto. No, Swerve contains sugar alcohols which are subtracted from the carb count. Do you cook the same time and temp for muffins? No, I would start to watch closely at around 12 – 15 minutes. Awesome! Thanks so much for letting me know. So glad your family enjoyed it. I made this in my muffin tin instead and they are SO good! Definitely hits my fall pumpkin cravings! Thanks for sharing! This is DELICIOUS. I’ve made it twice in the last 2 weeks, once for us and once for a bake sale. I am going to a friends for a gathering and am curious about making it into a “bar” in a 9×13 pan with cream cheese frosting. I’d probably reduce the swerve in the recipe by quite a bit to offset the sweetness in the cream cheese frosting. But any ideas about altering it for a 9×13? I know it’s a long shot, but I’m not a very experienced baker. I’m so glad you enjoyed it. You would prob need to at least double it, but I haven’t tried it to say for sure. Yay! So glad you enjoyed it. I love puke think you’d at least need to double the recipe, but I haven’t tried it. Hi! I see coconut flour in the instructions but not in the ingredients. How much does it need? Thanks! Never mind, found it! Sorry old eyes. Made these last night. I had to use mini bundt cake pan. So, kind of like cupcakes. I had a hard time getting them out of the pan (I did grease the pan) because they were still pretty moist. I am not sure what I did wrong. However, if you get over the fact that the texture isn’t really like “bread” – it still takes really good! I always use parchment paper as I’ve found that keto baked goodies tend to stick a little. I did keep mine refrigerated and I’m not sure if it would freeze well. I had frozen some and just had it for a snack. Just as delicious as fresh. This site is using your photo’s and recipes as their own. Are the macros correct? I doubled the recipe to use a regular loaf pan and I get a carb count of over 26? I have done it twice in my fitness pal. So upset! Sm I doing something wrong? You have to back out the sugar alcohols from Swerve. My Fitness Pal doesn’t do it automatically. I found that I needed to cook it longer…it was a bit too ‘wet’ for my taste, But, the flavor was awesome! Yes, every oven cooks differently. Glad you loved the flavor. So good!! I made this for me and made regular pumpkin bread for my family. Loved it, very moist, pumpkin tasting and I loved the sugar topping. For serving size it says 1/8th. Is that 1/8 of 1 mini loaf? Or 1/8th of the whole recipe? Sorry just want to understand so I dont eat double and not track it! The best thing I’ve eaten since I sarted Keto 7 months ago! Thank you. You can, but it’s not a 1:1 substitution. You’ll want to google how to replace for detailed instructions. My daughter is allergic to almonds so I’ve never cooked with it. Hi. Can you taste coconut? I can’t personally, but I love coconut. Oh thank goodness for this! I tried to convert a metric recipe for a pumpkin bread a few days ago and it was a disaster. This looks like something I can do correctly. Thanks! Sure! I hope it works for you! I’m allergic to coconut what to you recommend to replace it with??? Thanks ahead of time, excited to make this. Perhaps almond flour and butter? Although, almond flour is not a 1:1 substitution so you’ll want to google for further directions. I don’t use almond flour because my daughter is allergic to almonds. Has anyone tried this with pyure? Half the amount of course. I just made the pumpkin bread and it is wonderful, thanks for all the good recipes. I am going to freeze one and eat the other one. It says 8 servings, is this for both the loaves or one loaf? I’m so glad you loved it. Thanks so much! The 8 servings is for both. I made this today without the icing and the flavor is amazing!! Fantastic! So glad you enjoyed them. Thanks for this recipe and your candor in saying “it’s not like the real thing” which is so misleading with so so many Keto proponents. . I really hate the cool feel of Swerve. So, this is ok, but I probably won’t make it again. But I might eat up both loaves. I’ve thrown out most other Keto baked goods I’ve tried so far.. oh, and I buttered my slices. Yes, I have read so many things that say this tastes just like the real thing and it created an unrealistic expectation. Perhaps try MonkFruit as an alternative sweetener. I don’t think it has a cooling sensation at all. Thanks! I just baked it again. I decreased the Swerve—I didn’t meansure but I probably removed at least a TB. I separated the eggs, beat the whites and folded them in at the end. I added some Lilly’s chocolate chips. Really good. Oh, and less Swerve was just what was needed to remove the cool feeling. Is the monk fruit same amount as the swerve if replaced for swerve? Sometimes monk fruit tastes a little sweeter to me. It may need a little less. Made the pumpkin bread but got very disappointed. First, it took much longer in the oven as the middle was still jiggly. 2nd, it was extremely sweet! 3rd, it did NOT taste like pumpkin bread at all. I used fresh puréed pumpkin from my garden & used the pumpkin spice as well. Hmmmm?! I only tested this recipe with canned pumpkin perhaps that made a difference in the taste and the texture. I made ours last night to find after 60 minutes the middle was still jiggly. I used a greased disposable bread pan. Ended up placing in a cake pan and smoking out the batter and made brownies. Their good but wish I had the bread instead. It may have been the disposable pan. Keto friendly flours can be finicky but you may have just needed to continue cooking it as the disposable pan may have affected the bake time. You could, but it is not a 1:1 substitution and almond flour will change the taste and texture. I just tried this. I love it! I added about half of a sugar free vanilla pudding mix and about 1/4 cup of heavy whipping cream. So good! I put some whipped cream cheese on top when I ate it. It has a nice texture. I did not put the icing on mine. I chose to top it with whipped cream cheese instead. Im trying keto for weight Loss but have a huge sweet tooth. But I LOVE Starbucks pumpkin bread. Do you think it’s similar? I have never tried Starbucks pumpkin bread so I’m not sure. Keto bread is very different than regular bread with fluffy gluten-filled white flour and sugar. 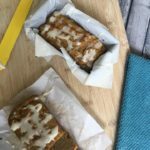 I do think this is a great keto pumpkin bread and it is one of my most popular recipes. I doubled the recipe but found I had about 1/4 cup of extra pumpkin purée in the can so I just put it all in. I did not change the amounts of any other ingredient. It came out delicious. A little more like pumpkin pie. So I made a whipped topping instead. So Good. Thanks for the recipe. Sounds perfect to me! Glad you enjoyed it. Oh, my gosh, YUM!! Kasey, this is a keeper. I just made a loaf from this recipe, followed your recipe except that I doubled it so I could make a large loaf, cut the sugar to 1 cup for the whole recipe, and added 1/2 cup of chopped walnuts. It did have to bake for 68 minutes, all totalled, but, man is it good. Moist and dense and delicious! I put a cream cheese frosting on it, but it really didn’t need it. Next time I’ll just simplify it by doing a swerve/cinnamon sprinkle on top and be happy with that. Thank you. This totally hits the spot and will be SO good with my coffee in the mornings. Hugs. Yum! That sounds fantastic! I’m so glad you loved it! Kasey. I just made these in my new Pampered Chef mini loaf pan (which means I got 4 little loaves) and I got to eat half of one! It is exactly what I needed today! Thank you! I even added the glaze (tho mine came out more like frosting because I’m still relearning how to bake – at 63 LOL!) I have a feeling I will be making this several times this season. I’ve read the comments and the recipe 4 times, but I’m not seeing where the amount of coconut flour that is to be used is. It is in the ingredients, but I’ll copy it below for your convenience. 1/4 cup + 1 tablespoon. Delicious! I doubled the recipe but used half almond flour and half coconut flour. It came out so good. I didn’t add the icing. Excellent recipe. Thank you for sharing! Perfect! So glad you loved it. How can your pumpkin bread be 0.3 g of protein? With 3 eggs in the recipe that alone would result in approx. 2.2 g protein per slice. Am I missing something here? I am not sure. I use a professional nutritional calculator that figures the information. That being said, it is always best if each person calculates their own macros with the exact ingredients that they use. I made this recipe and doubled it for a full sized loaf. It needed to bake for about an hour in my oven. It tastes amazing!!! After it cooled I put it in the fridge and cut a slice and ate it cold and it tastes like pumpkin pie to me. It’s very moist and dense. It didn’t need the icing in my opinion and I’d probably cut back on the swerve a bit. Great recipe, thank you for sharing! Oh my gosh…This is so good! Thank you so much for the great recipe. This is the first pumpkin keto recipe that has worked for me. I love it!!! This may be one of my favorite fall recipes yet, making it tonight for the second time. Thank you soooo much! I’m allergic to dairy! Can I sub ghee and coconut milk yogurt for butter and sour cream? I’ve only made the recipe as is, but it’s worth a try. Can I use something other than coconut oil?